The second stage will rally Le Marin in Martinique, departing from Las Palmas de Gran Canaria, beginning of November. 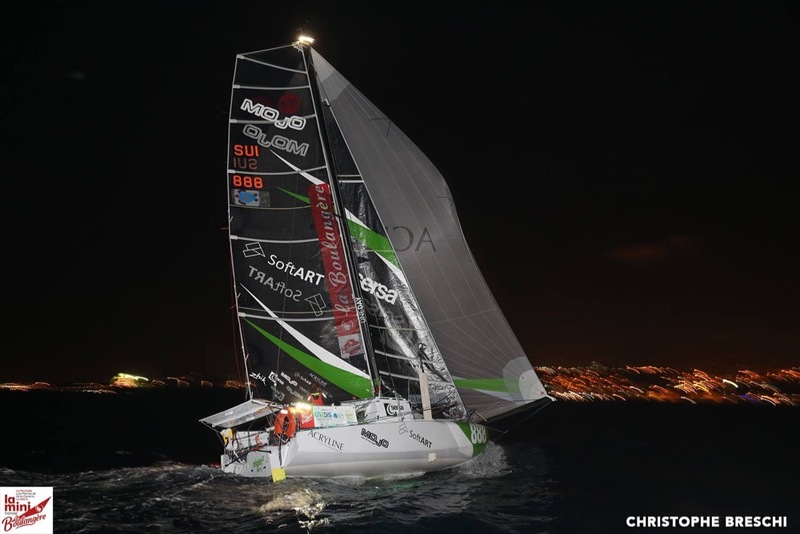 This first stage will go down in Mini Transat history as one of the longest ever. The race started on Sunday 1 October at La Rochelle (FRA), and the 81 solo sailors departed upwind, with a heavy head-on swell. Conditions were difficult for all, and especially so for Eight Cube, with its scow bow, which comes into its own in strong winds but not in head winds. Sailors then passed Cape Finisterre downwind, an ideal situation for Simon, who rose to the third place in the rankings. Competitors then found themselves in a no wind bubble almost until the finish, prolonging the duration of this first stage by several days. It finally took Simon ten days to reach the Canaries. Beyond the weather and sporting aspects, he also had to ration his food and water to reach the finishing line. Simon recounts his race: “The start was a bit difficult, our upwind speed wasn’t great. The downwind conditions we then encountered saved it for me; we were fast, it was fantastic! I felt that my rivals were being conservative at Cape Finisterre, enabling me to catch up. However, we only had one and a half days with a bit of breeze, then we were back in low winds. After passing the Cape, I realised I had lost a closing plate on the hull, which caused a stream of water to pour in the boat and didn’t help. In the end I didn’t do too badly! I managed to keep my place in the lighter winds thanks to a good route under the clouds. The last two days were harder, in a straight line and in such low winds, there weren’t many options. I could see the others ahead of me but couldn’t get closer to them. I am pleased with the changes made to my boat since the last edition, we are getting there! If I had still had my foils, I would have probably ditched them at sea!” “There is a bit of work to do now, but overall I am satisfied! The start of the second stage should be 31 October.